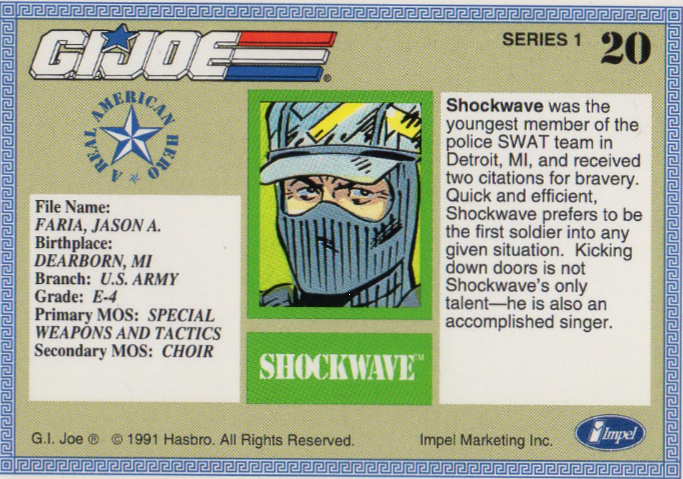 Now without further ado, let get talking about Card #20, Shockwave. I have to confess, that I´m not very familiar with this figure. I never had it as a kid, and can´t say I ever saw him in the stores (or I just can´t remember seeing him). 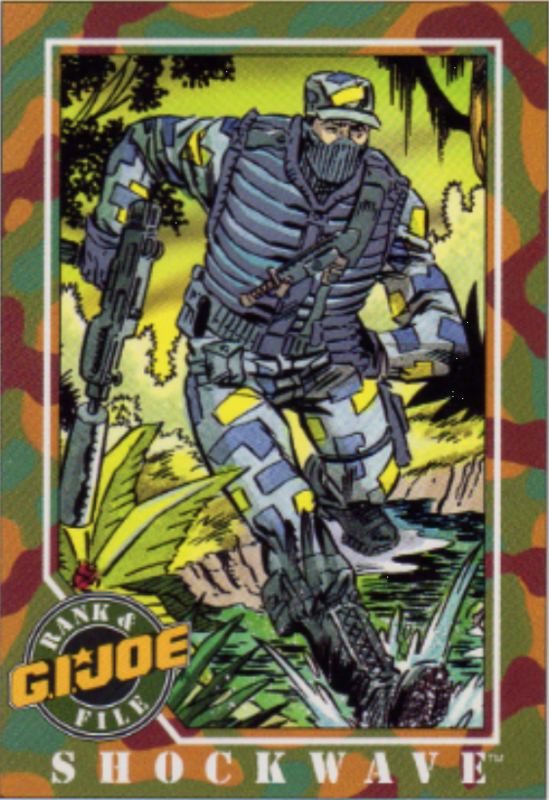 The card art is a bit strange, the guy is a SWAT member, but is shown running through what appears to be a jungle setting. I suppose Joes should be able to work in any environment, so I´ll go with it. The card describes him as being a gifted singer. Was there ever a musical episode of the cartoon? Other than Cold Slither, I can´t think of any. Maybe there should be a Broadway version of G.I.Joe The Movie. Can you picture that magnificent intro played by a classical orchestra with a full musical cast on stage performing? EPIC! Looking back, I don´t know why I haven´t looked harder to find a Shockwave figure. I really liked the story and he played a major part in it. Then again, by the time I read the comics (I only had 3 TPB of the Special Missions in Dutch), it would have been around 1994 (I was 12 or there about). After 1994, it was very hard to find Joes in the stores here and I was still far from discovering eBay and online shops. Since April this year (see Comic book update), I have completed my Marvel ARAH run and thus my focus is shifting now back to collection more figures and vehicles. Of course, the odd paraphernalia associated with G.I. Joe and Trading Cards will always spark my interest. And Action Force, Funko Pops, The Corps (I´ve got my eye on The Beast right now, just waiting for a reasonable shipping cost), LEGO (or other building blocks that can be used with the Joe Kre-O´s), or well, basically anything geek.